When it comes to fighting giants, sometimes all you need is something small. In Africa, the proverbial Goliath is the iconic elephant, which not only faces ongoing pressures from poaching and habitat loss but also, unfortunately, from increasing levels of conflict with humans. All too often, elephants raid peoples’ crops in search of food. Sometimes they’re wounded or even killed in retaliation. The nonprofit Space for Giants estimates this costs African farmers more than $1 million a year and puts hundreds of elephants at risk. Enter the tiny solution for this giant problem: the honey bee. 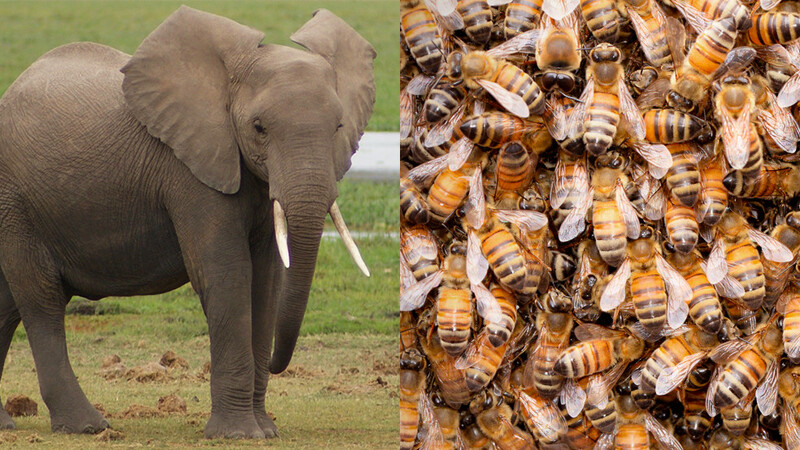 Elephants, it turns out, are afraid of bees, which can sting them around the eyes and inside their trunks where their thick skin cannot protect them. For the past several years, researchers in eastern Africa have experimented with using beehives to prevent savanna elephants (Loxodonta africana) from eating people’s crops. Since they were first used in 2008, fences constructed of beehives have proven incredibly effective in Kenya and other eastern African nations. The practice hasn’t caught on in Central Africa, however, mostly because forest elephants (Loxodonta cyclotis) have suffered some of the greatest poaching casualties and have been all-but wiped out in many regions. But even in Central Africa, elephant crop-raiding remains a problem. And according to a paper published recently in the journal PLoS One, bees can once again provide a solution. Lead researcher Steeve Ngama with Université de Liège in Belgium, who put the beehives to work in Gabon, said he was actually surprised by how effective beehives deterred elephants there. “Most local populations in Central Africa do not believe that forest elephants are afraid of bees” because of their dense skin, he said, noting that even he didn’t think bees would mobilize to defend their nests from an elephant-sized threat. The research proved everyone wrong. Ngama and his fellow investigators found that hives with a high number of bees successfully defended nearby fruit trees from most raiding elephants. It all depended, they found, on how many bees the hives contained and how much fruit was in the area. If there were too few bees then the hives weren’t effective. If the trees were completely full of ripe fruit, the elephants would sometimes take the risk, but their raids were much shorter in duration and they ate less. “It’s so encouraging to see this whole concept taking off,” said Lucy King, one of the researchers who first pioneered the use of beehive fences and now heads the human-elephant co-existence program for Save the Elephants. She said the idea has recently been put into practice in several new countries, including two nations outside of Africa. One of the biggest successes so far for these beehive fences has been in Tsavo National Park in Kenya. King reported that human-elephant conflict there has fallen by as much as 80 percent and created new opportunities along the way. Not only do the hives reduce crop raids, they also provide income through the sale of honey and increased pollination that more than makes up for the crops the elephants still manage to eat. Unfortunately, Ngama said there hasn’t been much success expanding the program in Gabon, mainly because he has not yet been able to secure additional funding. That’s an important element, he said, because the local people need to be taught the basics of modern beekeeping. “Most traditional beekeeping techniquess involve killing all bees from a nest, threatening colonies and bee conservation,” he said. Ngama hopes to eventually put beehives to the test near Gabon’s farms, an important step to prove that they will provide economic benefit there. The work can’t come soon enough. At least 65 percent of Central Africa’s forest elephants were wiped out by poachers between 2002 and 2011. The few elephants that remain need every protection that they can get, even if it just comes from the tiny bee. Freelance journalist John R. Platt covers endangered species and related environmental topics for Scientific American, TakePart and other publications. He lives in Portland, Oregon. Do the World’s Three Remaining Northern White Rhinos Have a Future?